Home Management 101 – What is a “Smart” Thermostat? Where does a smart thermostat fit in a home automation system? Your thermostat: A gateway to savings. Home energy management starts with the thermostat. In the U.S., more than 8 percent of energy consumption is controlled by the thermostat. 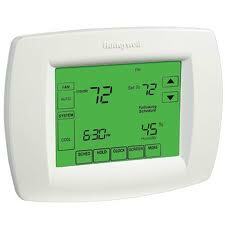 Most homes these days have a programmable thermostat. In fact, 40 percent of existing homes use programmable thermostats while almost 100 percent of new homes have them installed. But that doesn’t mean that people are taking advantage of them. There is one major reason for that: Programming a thermostat is easier said than done. For over 60 years we have providing heating and cooling service. Our experience tells us that a majority of programmable thermostats are left in manual mode. Many homeowners tell us that they rarely or never change the program (kind of defeating the purpose of a programmable thermostat). So if you’re like most people and you’re not taking advantage of your programmable thermostat they way you could, what can you do about it? Here at Burns & McBride Home Comfort we have a solution. It’s a Honeywell “Smart” thermostat. It’s similar to a programmable thermostat, but with one key difference: Every time you leave your home it is smart enough to turn the heat off. Your Honeywell “Smart” thermostat is connected to the Internet through your Burns & McBride Go!Control. Having your thermostat connected to the Internet through our interactive website keeps things simple. Through Internet access or your smart phone, you can control your heating and cooling whether you are at home or away. It only takes a few seconds to set up a schedule based on government-approved Energy Star heating and cooling programs. And you can do it all through your Burns & McBride Home Comfort online account. The smart thermostat communicates with your Burns & McBride Home Comfort home security system. When you arm that system, the smart thermostat can automatically raise or lower the temperature. The thermostat adjusts to your schedule; not the other way around. Every time you leave home and arm your system, it will turn the thermostat back! When you return and disarm the system, it returns to the original settings. You will even receive a text or email notification if the temperature in your home crosses a high or low temperature threshold. In’t it better to know that you have a problem with the heater at 10 in the morning rather than finding out at 6 in the evening when you get home from work? Having a simple way to manage your energy saves you money. Simply using a smart thermostat will save energy and save you money. Reducing the temperature on your thermostat a few degrees when you are sleeping or away will save money over time. When using government-recommended Energy Star heating and cooling schedules, you can expect to save around $30 a month. Smart thermostats may seem like a small thing, but at the end of the day, they make a huge difference. They are one of the simplest ways to manage your energy consumption and save money. Do you have a Smart Thermostat? The Honeywell “Smart” Thermostat is a standard feature on our Smart, Safe Home System. Call us today at 302-656-5110 or visit our website at http://www.burnsandmcbride.com to learn more.